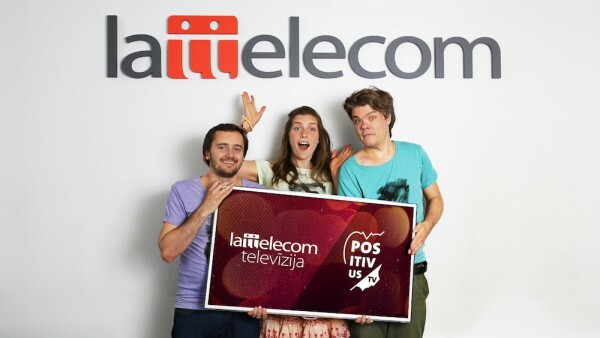 Starting from Thursday, July 10th 7:00 all Lattelecom television platforms will feature a new channel – Positivus TV. The channel will be broadcasted 24/7 and will offer viewers various concerts and shows before the festival and some of Salacgrīvas biggest artist’s concert recordings after the festival. “After eight years Positivus Festival is finally on TV. We’re happy that Lattelecom, with their technical possibilities, have become the festival’s main partner, adding a new quality to the event’s development. With its own TV channel the festival will instantly increase in size, due to the large numbers of television and online viewers” tells Ģirts Majors – Positivus Festival organizer. “With the telecommunications giant joining Positivus, Lattelecom’s technological support provides the festival with an unprecedented experience, offering viewers the first Latvian festival pop-up channel – Positivus TV. Lattelecom has repeatedly declared its commitment to providing support for the popularization of national content – with Positivus TV channel being a clear affirmation! The TV channel has been created in close partnership with Latvian Radio, which is one of the pillars of the Latvian united public media space” explains the Lattelecom board member and CEO Juris Gulbis. “The new Positivus TV audio-visual channel is a perfect example of a partnership, for it unites the giants of two domains – Latvian Radio and Lattelecom, ascending the festival giant Positivus to new heights. We are proud of this cooperation project and we hope that more partnerships projects of this scale will be created in Latvia, because it’s the only way to provide truly meaningful and interesting content for the audiences” reveals Latvian Radio board member Jānis Siksnis. Positivus television will be available 24/7 – in the mornings Positivus TV programme will commence with the latest music videos of festival artists as well as the opinions of various local celebrities about the festival in general and the key to its success. This will be followed by the “Made in Latvia” broadcast, which will feature interviews with Latvian artists who have performed at the festival in previous years. As expected of a music channel, an inseparable part will be devoted to festival artists and their concerts, offering four different recordings of previous festival performers every day. And during the evenings, you’ll be able to meet and get to know this year’s foreign artists together with Artis Volfs and Toms Grēviņš. The “Aizkulises” (Behind The Scenes) broadcast will provide visitors with all the latest information for festival preparations. Ticket prices are set to increase from July 14th - a 3 day ticket without camping will cost EUR 62 and a 3 day ticket with camping - EUR 68. So far a 3 day ticket without camping costs EUR 57 and with camping - EUR 63. Tickets are available at www.positivusfestival.com and all Biļešu Serviss box offices. As previously announced, Lattelecom stage will host Kraftwerk, Bastille, Ellie Goulding, Elbow, The Kooks, The 1975, Daughter, Anna Calvi, The Horrors, You Me At Six, AlunaGeorge, NONONO, FM Belfast, And So I Watch You From Afar. Nordea stage will feature Tricky, Chet Faker, Pharoah Sanders Quartet, Laura Mvula, Junip, Temples, Of Montreal, MØ, Future Islands, King Charles, Kid Karate, Justina Lee Brown&Latvian Blues Band, Birth Of Joy and Dzelzs Vilka Jauno Jāņu Orķestris. You can find the full artist and stage schedule here.